Special glasses, earphones and a controller helped Kevin Wong play a game at Adventure VR on July 6. In a nondescript office space in Kakaako, great adventures are taking place. Spaceships are swooping around, huge jack-o'-lanterns are flying by, volcanic boulders and flaming bows and arrows mysteriously appear, beckoning you to throw or shoot at something. It's all part of Adventure VR, a new virtual reality game that will have your brain teetering on the edge of reality while your nerves teeter on the edge of space. Strategically, the game is similar to escape-room games, which have been growing in popularity, Banel said. In those games, participants try to break out of a room by cracking codes and finding keys, working together to solve the puzzle. Adding virtual reality takes the game out of a room and into otherworldly, spectacular locations, where players are called on to combine their efforts and complete certain tasks, or “missions.” The fun for players, he said, is in working together to navigate the missions while experiencing the wonder of his virtual spaces. “It's not something you do alone, it's something you do with others,” he said. “You communicate with others, exchanging all the clues that you find. You go there and you don't have any clues. You have to find everything by yourself, and experiment. 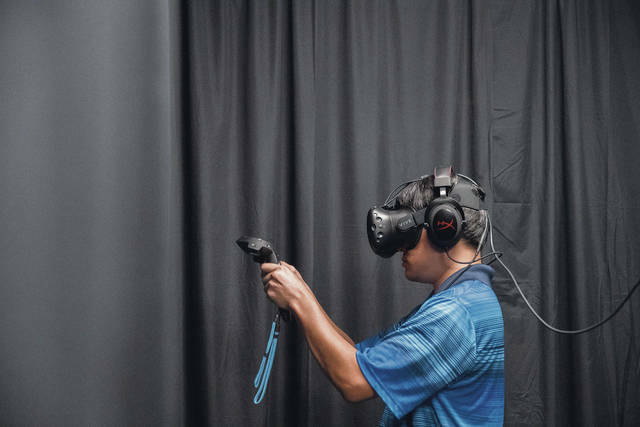 Another virtual reality facility, VR Junkies opened at Ala Moana Center last year, offering games like minigolf, “Cowboys and Aliens” and lightsaber duels. TO SEE what this new style of game is all about, I tried it out with my cousins, the Wong family of Aiea. Each of us was stationed in a 10-foot-square curtained-off space and equipped with a wired pair of VR glasses. Using one-button hand controllers, we could pick things up, move them around and toss and catch them as needed. We were also outfitted with headphones so we could talk with one another. The game started - and it was as if we were instantly transported to a small platform hanging in the sky. A beach ball floated in midair there, giving us the opportunity to learn how to use the controllers. We weren't given any clues, so had to figure out what came next. After searching and experimenting a bit, we were able to figure out that some small cabinets on the platform contained a battery and a hard drive-like device, which, once placed in a special slot, spelled out our mission. In this case, it was to rescue an imprisoned squid-like creature. From there we were transported to the deck of a spaceship, where we were embattled by smaller attack vessels that had to be destroyed. We then moved on to a huge chamber where the creature was being held. Using tools ranging from rocks to ray guns, which we had to learn to use, we continued the mission. Progressing from mission to mission, we visited a mysterious cave, then a forbidding tower, encountering items that piqued one's curiosity - what was a toilet seat doing in that chest? Some items seemed useful (a set of keys?) but some weren't. If we figured something out, we could call our teammates and explain what to do, as all four of us had to complete a given task before we could progress. EVERYTHING SEEN in Adventure VR is virtual, but the technology is so advanced that it can trick the brain. In one task, you have to throw virtual rocks at attacking robots. The rocks are weightless - in fact they don't even exist - but they seem to have heft and weight when you pick them and throw them. The games even provide a bit of a workout as you bend and turn or walk around your enclosure as you travel from one space to another. My cousin David Wong, a photographer, actually was a bit unsettled by the high-rise scenery of many of the adventures. “Watch out for heights! If you're not one for heights, it will wake you up,” he said. Adventure VR's visuals are spectacular, each one a masterpiece of creativity and art, and with 3D effects so real you'll duck when objects fly at you. Invariably, our first reaction upon moving to a new stage was, “Wow! Look at that!” By itself, the scenery was enough to draw us into the story. Adventure VR's technology has been specially designed to account for the dizziness or vertigo that people have complained about it in other VR games, Banel said. We were able to play for a full 90 minutes with no problems. Every movement we made seemed natural and consistent with what we saw. Adventure VR currently has four missions, with most teams - groups of up to four can play at one time - able to complete three in the allotted hour. The fourth adventure, Banel said, has proved difficult for most average-age groups, but teams of younger, tech-savvy members have been able to figure it out. Players have ranged from age 6 to 60, Banel said. Banel first came to Hawaii 20 years ago to work on the 3D film “Final Fantasy: The Spirits Within.” Through the years, he has remained active in the film industry by animating clothing in movies, making sure that Superman's cape flows properly in the wind or that Batman's suit wrinkles properly when he fights. He and his team plan to create more missions - it took several months for them to create the four they have now - but they want to get more local programmers and graphic artists involved to produce them, possibly drawing from college students. David's wife, Karie, said Adventure VR already provides a lot of fun without having to dip into Hollywood themes. “It's waaay better than a movie,” she said.